What is your job, what do you work on, and what is your involvement with GoMAMN? I’m the GoMAMN Postdoc/Conference Call Organizer/Google Docs Manager; more specifically, I am a Postdoctoral Research Associate at Mississippi State University, based out of the Coastal Research and Extension Center in Biloxi, MS. I work on the structured decision making that is the foundation of GoMAMN. Right now, that means helping to coordinate the strategic monitoring plan chapters, building and publishing the portfolio decision support tool, and presenting GoMAMN’s work at conferences. More broadly, I’m an applied quantitative ecologist who uses field and quantitative methods to better inform conservation and management of wetland birds, especially rails. My PhD focused on rail autumn migration and wetland management, and I continue to work on rail migration and field/analytical method development for rails during all times of year. 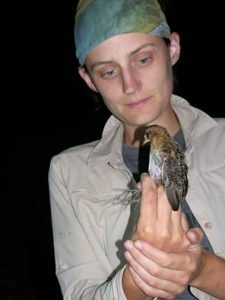 I’m also passionate about making ecology more diverse and inclusive and have been working for several years now to raise awareness about the barriers that unpaid labor in ecology creates for many, including working with some economists on looking at labor outcomes for science graduates who do and don’t take unpaid work (paper coming soon!). Are there any particular areas you are seeking collaboration or willing to collaborate with others? I’m always interested in trying to detangle issues of detection probability with new quantitative or field methods. I’m currently looking for some folks who would like to dive into better understanding Virginia Rail molt, since some of my stable isotope migratory connectivity work suggests that we might not understand their molt as well as we think. I grew up in rural northern Ohio, and with my four younger brothers, had a blast playing all over my grandfather’s farm. I was very lucky to fall into wetlands and birds in high school through Black Swamp Bird Observatory. I then went to Michigan Technological University in the Upper Peninsula of Michigan for my BS in Wildlife Ecology and Management, where I loved daily cross country skiing the many months a year it snowed (oh, I miss snow!). After a seasonal job in Hawaii, where I learned how sharp lava is while carrying double high mist net poles daily, I started my PhD in Biology at the University of Arkansas with the Arkansas Cooperative Fish and Wildlife Research Unit. During my PhD I worked closely with US Fish and Wildlife Service and Missouri Department of Conservation to better understand the autumn wetland management tradeoffs for rails and waterfowl, while exploring the Ozark Mountains, preferably by kayak. I finished my PhD in March 2017 and started with GoMAMN shortly after. I love spending time outside, hiking, backpacking, birding, kayaking, biking, and gardening. Most of my gardening is either succulents or vegetables/herbs. I currently have 6 kinds of basil, which some might say is too much. I love cooking, especially for other people; lately I’ve been getting good at pizza on the grill. My husband and I have two dogs, a far too smart White German Shepherd and her sidekick, a very loving Black Labrador Retriever that neither retrieves nor swims. Besides a coordinated and integrated monitoring program, what do you see as another essential need for furthering avian management in the Gulf of Mexico? We need funding and institutional support so that once we have integrated monitoring, we can take advantage of those data and roll them up to answer bigger questions about status/trends, management, and ecological processes. Even with integrated data, this will require many dedicated people hours to accomplish. 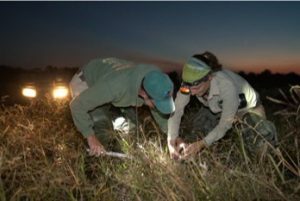 There is abundant capacity within the many fine ecologists, managers, and other members of the avian conservation community to do this work. However, other things will take priority unless we have the funds to support folks’ salaries, so they can focus on these important large-scale projects. Where is your favorite outdoor place on the Gulf Coast? I live <5 minutes from Gulf Islands National Seashore, and it’s an amazing place to explore in any season. If you could befriend 3 famous people (living or dead), who would they be? I would love to meet Rosalie Edge (Founder of Hawk Mountain), Lynne Cox (first person to swim a mile in Antarctic waters), and Patrick Rothfuss (my favorite author). You’re a major league baseball player. What song do they play to rev up the crowd when you come up to bat? I am my father’s daughter 100% in my music and my love of baseball, so I’ll go with “Runnin’ Down a Dream” by Tom Petty. Any other little-known fact about you that you’d like to tell us? I raised goats in 4-H, one year training my goat to stand on its hind legs and spin in a circle on command and speak when spoken to. Our neighbor bought her at the county fair and she continued to stand up and spin on command for years after. Her name was Bunny. If I go help with a project that is trying to capture or observe Black Rails, they will not capture or observe one while I am there.